‘Lock your doors, load your guns,’ sheriff warns. Shortfalls gutting Eastern Kentucky. 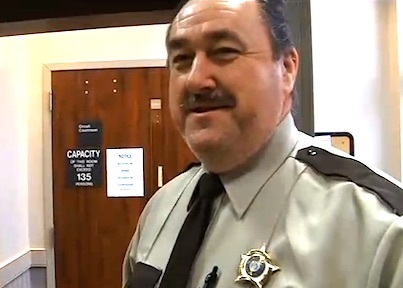 INEZ – Martin County Sheriff John Kirk took the stage without invitation at a fiscal court meeting Monday and railed about the budgetary strains afflicting his office. The issues plaguing the Martin County Sheriff’s Office and the county’s fiscal court are similarly felt by local governments throughout Eastern Kentucky, where sharp declines in coal severance taxes have forced county governments to make spending cuts and layoff workers. 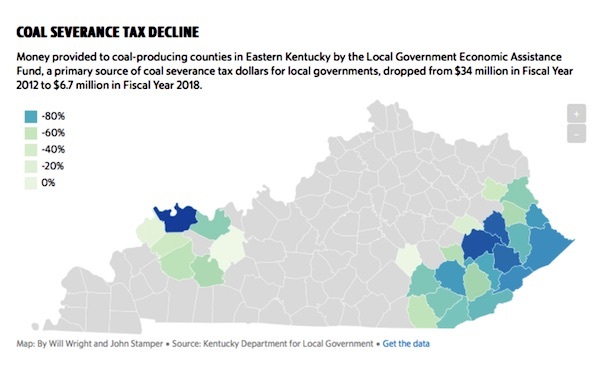 Money provided to coal-producing counties in Eastern Kentucky by the state’s Local Government Economic Assistance Fund, a primary source of coal severance tax dollars for local governments, dropped from $34 million in Fiscal Year 2012 to $6.7 million in Fiscal Year 2018. In Knott County, the fiscal court approved a partial shutdown of county government last month, and officials in Pike County have already made layoffs and proposed a major rate increase for garbage pickup. Martin County officials also blame declining revenue and coal severance dollars for the delayed sheriff’s payment. County officials said they hope to pay the sheriff’s office the $75,000 pledged, but could not say when that payment would be delivered. Victor Slone, the sole remaining member of last year’s fiscal court and the magistrate who bore the majority of Kirk’s criticism, said county officials have continued to pledge $140,000 or more to the sheriff’s office each year, even as the county’s own revenue has declined by about half in the past eight years. The fiscal court this week approved a new sheriff’s budget, which included the promise of a $140,000 subsidy from the fiscal court. Kirk said he is concerned that residents will not have access to quick law enforcement response without his office. The responsibility now falls solely to Kentucky State Police, which sometimes has just one officer patrolling multiple counties in this mountainous corner of Eastern Kentucky, Kirk said. William Petry, the public information officer for KSP Post 9, which covers Floyd, Johnson, Magoffin, Martin and Pike counties, said it puts a strain on state troopers if they can’t rely on help from local law enforcement. Oh there should be plenty of taxes and jobs from all the tree hugger pie in sky wind mills and solar farms ! Just keep marching to the socialist drum ky. Keep trying to read a book from light of one these new dim whit lights while al gore gas lights his driveway and mansion at tune 1200 bucks a month or poor champion of down and out Bernie Sanders the MILLON dollor communist pimp visits his 3 homes ! What fools.